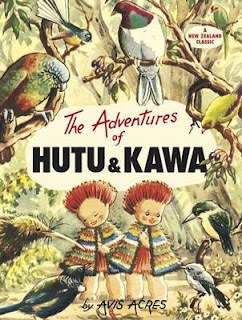 The Adventures of Hutu and Kawa is a classic New Zealand children's book from the 1950s. It isn't your usual picture book, but more of a story book. Hutu and Kawa are two babies of the forest who want to go on an adventure. With the help of Old Grandpa Kiwi, they build a canoe. The birds and the forest folk also pitch in and give them gifts for their adventure. However, being on their first adventure, everything is scary. They find many willing animals that help Hutu and Kawa survive and get back to their Pohutukawa tree. This is definitely a delightful story that has a lot about New Zealand flora and fauna. The pictures do have that old school feel about it, but at the same time, stunningly beautiful. The hardcover edition of this book is also something special too. It is hardcover but it also has a soft outer exterior and holding it while reading was very pleasant. Another great book that have happened to stumble upon. Margaret Mahy has written many great books over the years. We all have a favourite of hers and we probably haven't read many of her works either (there are so many). The Great White Man-Eating Shark is a very clever twist/parody of The Boy who cried wolf. In this version, the boy actually has a purpose when crying wolf, he wants the beach, all to himself. This book is called an early reader, which means it is a stepping stone from picture books to reading (chapter) books. But don't let this book fool you, as there are many words that are good for discussion with your wee one. Words like resentful, wicked and dorsal are just some words that will help children gain a bigger vocabulary. 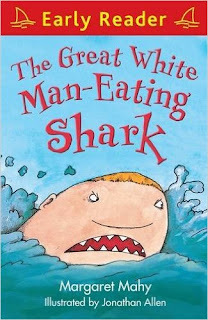 There are also many other Early Reader series books, but only The Great White Man-Eating Shark is a Margaret Mahy book. 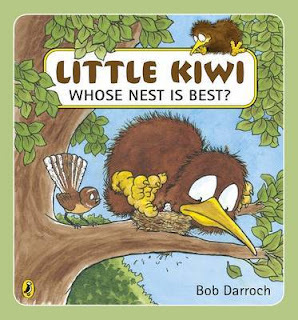 Little Kiwi is one of those iconic books that many have seen everywhere. There are many books in the series, and sometimes you have to wonder if the quality is still there after all the years. For me, it is an emphatic yes! I love books that have great pictures, lots of learning and sometimes in between, a bit of humour. Whose Nest is Best is definitely right up there. It has many (all) native birds that children can learn about. Keas, Moreporks, Blue Duck (Whio) and many more are in here, and something that every kiwi should know about! The book is a bit of Goldilocks, finding something that is just right, but the overall message is more Wizard of Oz, there is no place like home. Go give this little treasure a go! Good things come to those who wait. That's pretty much the motto of this book, the second in the series of Mr Panda books. 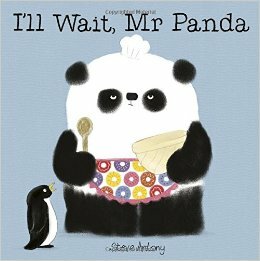 The pictures are solid and 'I'll Wait, Mr Panda' is definitely no frills. There is an array of animals to look at from Llamas to penguins and if you do a little bit of searching you can see a bit more detail in the pictures. Overall, a good junior type book with a good value. Patience!